©Trishamonster. Please do not use without my permission. 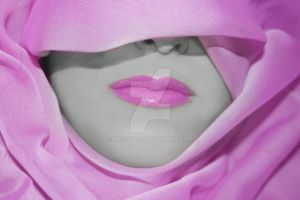 Well, to start with, pink is one of my favourite colors, especially on photographs and portraits! This portrait is really cute and fluffy. The composition is really well applied and all the existing pink tonality surrounding the face is incredible stunning; it gives us a smooth and warm impact. I love the expression and expression of her eyes there. The eyelashes are wonderful and makes the eyes have much more impact - it's the first thing that you look at right away. I love the piercings. Sometimes they can ruin a kind of portrait like this one (so clean and cute) because it gives us another idea, but not in this case; they're pretty light, smooth and they give the portrait two wonderful details, there. It's a wonderful portrait! Congratulations! OH HOW ADORABLE! What a beautiful model too! Congrats! This photo is being featured in the epic, disturbing, beautiful and very strange news feature: Goffs vs. Preps: An Artistic Feature. Please give it a look to see and promote your work! SHE'S PRETTY BUT IM HOTTER!!!!!! Pink is one of my favourite colours.Pink rules the roost and is womanish. If pink were a gender , it would be a woman. There is so much to talk about pink. Pink I love you ! You are just too lovely!!! I dont know, it's, like, pink? Love these sort of shots..
oh wow i just fell in love. This is just soo AMAZING! May I make a layout out of it? I will be sure to credit you! Its amazing!